For some reason opening the cottage this year seems to be taking longer that ever. Traditionally, May long weekend and it’s all done. Here we are on June 24th and the boat has yet to be flipped over and put in the water. Perhaps, the fact that I’m sitting around and enjoying my 2nd, soon to be 3rd cup of coffee that is impeding progress. With the cottage now entering it’s 26th year, every year seems to bring a new little challenge to the start up process. This year, it was the “blue thing” over there. It’s a part of the washing machine that as I write is shaking the cottage on the spin cycle. Hmmmm, that foundation really needs to be checked out. But hey, it’s been like this since day 1. Back to the “blue thing”. After getting the water on and hooking everything up, I thought I was done, but not so. On one trip into the workshop I noticed that the carpet was wet, never a good sign. It seems that one of the hoses was leaking. The first attempt was to tighten the hose. Didn’t work. Second try was to replace the hose as it seemed to be coming from the hose fitting at the “blue thing”. wrong again. 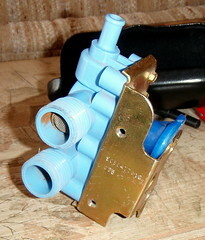 OK, now on much closer inspection, the “blue thing” had a very small crack in the thread fitting for the cold water.